Many of us use our smartphones for more than answering emails, sending texts and connecting with friends on social media; we may also use them to manage bank accounts, pay bills and apply for jobs. While having them makes it easier to manage our lives, it also makes our information more vulnerable to thieves and hackers. Using a lock screen on your iPhone or Android-powered smartphone may make it more difficult for hackers and thieves to break into your phone, as long as you have a strong passcode. Experts recently attempted to crack the code of Apple iPhones that used built-in time delays to prevent people and computers from breaking into an iPhone. * What they found is that the stronger your passcode, the less of a chance someone will be able to break into your phone and access your information. 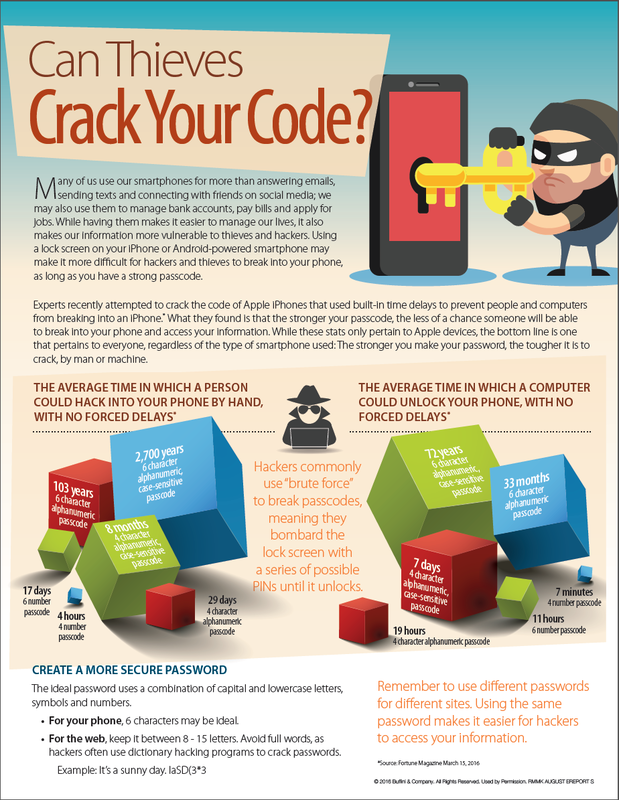 While these stats only pertain to Apple devices, the bottom line is one that pertains to everyone, regardless of the type of smartphone used: The stronger you make your password, the tougher it is tocrack, by man or machine. The ideal password uses a combination of capital and lowercase letters, symbols and numbers. • For your phone, 6 characters may be ideal. • For the web, keep it between 8 – 15 letters. Avoid full words, as hackers often use dictionary hacking programs to crack passwords. Remember to use different passwords for different sites. Using the same password makes it easier for hackers to access your information.